If you’ve ever tried to arrange some cool sounding horns using your DAWs software instruments, you’ve probably discovered that they are a poor substitute for the real thing. With this article we show you how to get better results out of your soft synth horn samples so that they sound as good as they possibly can. Whether you produce hip hop, soul or pop music, these tips should help you to take your horn arrangements to the next level instead of just using the lame defaults that can often sound so bad they’ll ruin your production. In your DAW, go to the acoustic horn section in your favorite software instrument sound library and load up your best horn ensemble. 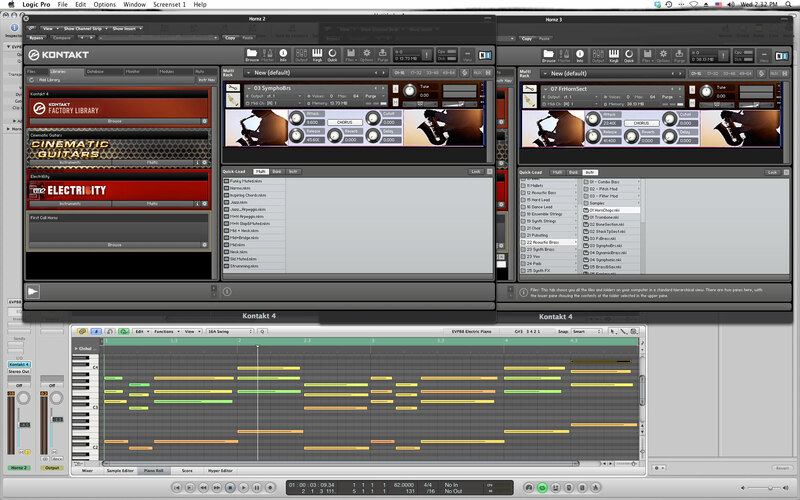 I will be using a sound library within Kontakt 3 for this demonstration. Record a simple 4 bar loop in your DAW using the horn ensemble you’ve chosen. Here is the loop I’ve recorded. Right now it sounds kind of thin so lets beef it up and layer it with 2 more horns that have slightly different tonal characteristics. Load up 2 more horn sections on new tracks in your DAW and copy the midi info you just recorded to those tracks. Here is what my second and third horn sound like. Now listen to what all three horns sound like layered together. The resulting sound is much bigger and has a cool ‘in-your-face’ vibe. Now, that we have the melody and the sounds picked out all we need to do is mix and polish it off. Pan your second and third horns a little to the left and right so they occupy their own sonic space creating more stereo width. Drop their volumes slightly so they sit just behind your lead horn. Bus all three horn instruments to an auxiliary track and load up some EQ and compression. Now, brighten up some the high frequencies and roll off some of the low-end frequencies that will muddy up your track. Add some mild to moderate compression and reverb to beef it up and give it more depth. Now lets listen to our horn loop. Nice! Throw in some drums, a bassline, some sort of scorching lead and you’re well on your way to making a certified Hip Hop banger! Get good at this layering technique! It was used to create a lot of our Hip Hop, RnB, and Pop Sample Packs and it’s effective on just about any instrument you can think of. I use it all the time on strings, horns, and drums. When you learn to do this with ease a whole new world of sound design will open up to you and your production will rise to new heights. The possibilities become limitless as there is no end to the types of instruments you can combine or layer.